The program allows a group of volunteers to visit Mt. Laurel’s students for presentations and discussions on great pieces of art. Bob Kaufman, front left, speaks about the Parade of Artists art-appreciation program at the Feb. 28 meeting of the Mt. Laurel Board of Education. Kaufman volunteers for the program to help Mt. Laurel students learn to appreciate art. The Mt. Laurel Board of Education took some time at its meeting last week to honor a group of volunteers who spend months every year developing the yearly Parade of Artists art-appreciation program for students. Several times a month from September to January, volunteers with the program will gather for short workshops to discuss art and decide on different art pieces to present to students. Then, in addition to volunteers reaching the pieces of art, volunteers will also research the artists, their techniques and the time period in which the pieces were created. Together, the group then develops individualized lesson plans for each piece. Once the group has selected a number of pieces from artists across genres, volunteers will go into Mt. Laurel’s schools to visit with students from second through fourth grade to present the pieces and hold discussions. This year, starting in January and lasting through March, the volunteers were scheduled to meet with 70 classes across the district’s six elementary schools. Once at the schools, the volunteers will present prints of the pieces they’ve selected for that class and begin discussions with eager students. 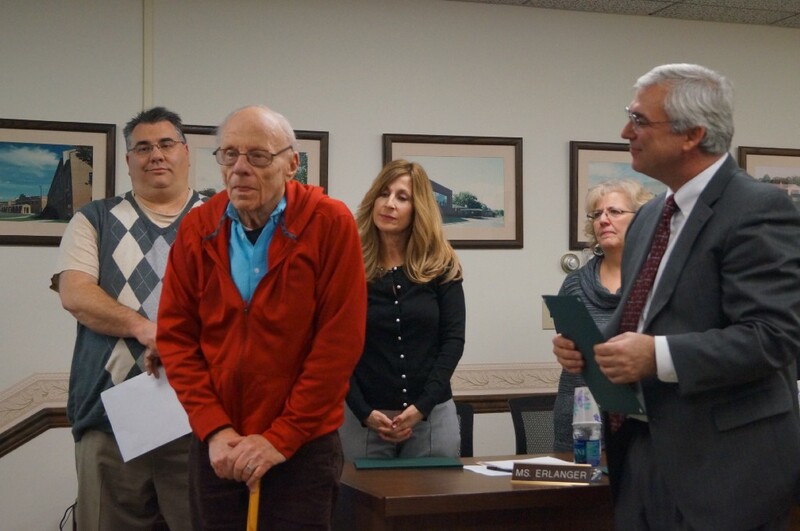 Parade of Artists volunteer Bob Kaufman spoke on behalf of the group honored at the meeting and thanked the BOE for allowing volunteers to enter the district’s schools and provide the Parade of Artists program. “It’s just great to be able to see the wonderful faces of these children as we present art to them. They’re really terrific,” Kaufman said. Kaufman also complimented the teachers in the district, describing them some of the greatest teachers he had ever met. Superintendent George Rafferty, who started with the district last year, said he was excited when he first learned of the program and thanked the volunteers who work every year to make the program possible. Rafferty also described the program as a way to help complement what the district already does in trying to help students appreciate the art of masters as well as their own art on an individual level. “We try to recognize and appreciate the art of our students, and by you coming in and sharing the art of great artists throughout history, I just think it adds a very nice layer of what we’re trying to do with our students,” Rafferty said. During the meeting, the board honored the following Parade of Artists volunteers: Nidia Branco, Bobbie Braverman, Diane Canzanese, Carole Cills, Lynn Grobman, Nancy Ireland, Linda Jacobs, Joan Johnson, Kaufman, Jane Kielt, Elaine Kristol, Faye Lyne, Marianne Schell, Jennifer Smith, Joan Wechter and Robin Weinstein.